Initial assessment team David Deines and Valerie Rzepka in a Bengali village. 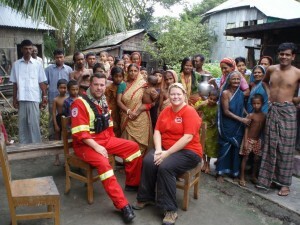 Tuesday August 28, 2007 – Gopalganj, Bangladesh – After meetings with local partner Fazlullah Foundation, two areas were selected to target for medical relief: Gopalganj and Gaibandha – both are in some of the most flood affected areas in Bangladesh. A medical clinic will be established along with two other networking NGOs including the Bangladesh Auxiliary Services for Social Advancement (BASSA) in Gopalganj and Udoyan Savolombi Shangstha (USS) in Gaibandha. Both organizations have been operating for more than 20 years and are fully capable with deployment activities. 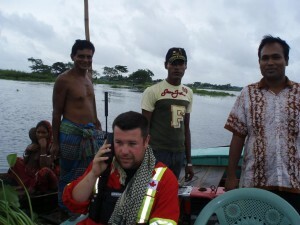 CMAT Field Assessment Officer David Deines discussing findings on the satellite phone with Bill Coltart in Canada. Medical issues according to CMAT’s assessment team include skin and eye infections, gastrointestinal infections, severe dehydration from diarrhea, and womens/prenatal issues. There is very high infant, child and maternal morbidity and mortality. The team deploying today will remain in the field for 14 to 21 days. A second team is being assembled and will be deployed in 1-2 weeks time to relieve the outgoing team. 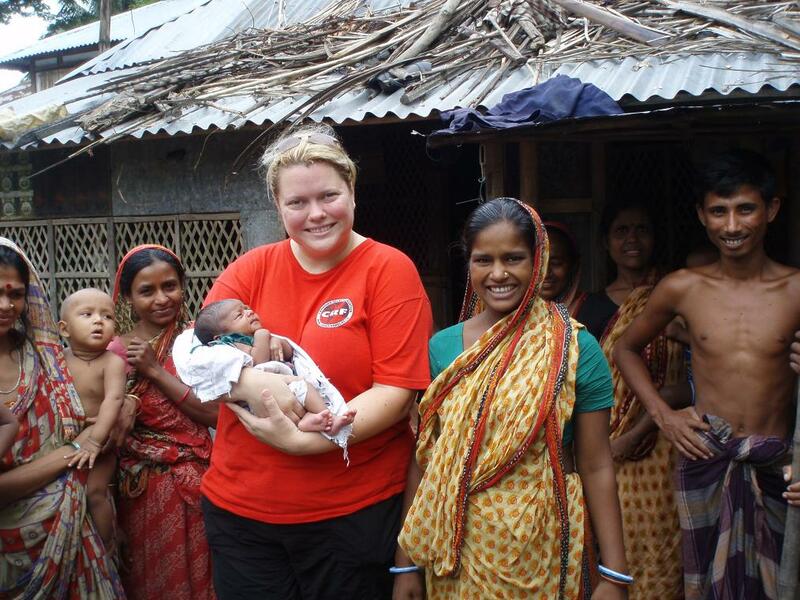 CMAT Field Medical Coordinator Valerie Rzepka visits a new mother and her baby in Gopalganj, Bangladesh. CMAT appeals to its donors to donate generously to help our medical teams assist the suffering children, women and families affected by the devastating floods.